Presidential election results map. 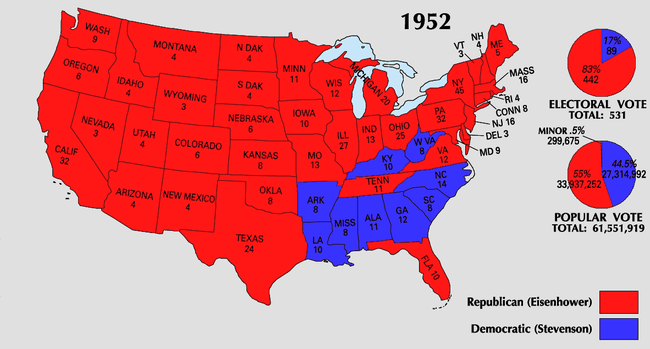 Red denotes states won by Eisenhower/Nixon, blue denotes those won by Stevenson/Sparkman. Numbers indicate the number of electoral votes allotted to each state. The United States presidential election of 1952 was the 42nd quadrennial presidential election, held on Tuesday, November 4, 1952. Republican Dwight D. Eisenhower was the landslide winner, ending a string of Democratic wins that stretched back to 1932. He carried the Republican Party (GOP) to narrow control of the House and Senate. During this time, Cold War tension between the United States and the Soviet Union was at a high level, as was fear of communism in the US, epitomized by the campaign of McCarthyism. Foreign policy was a main issue in the race for the Republican nomination. The nation was polarized over the stalemated Korean War, and the extent of corruption in the federal government became a major issue as well. The economy was prosperous and economic and social issues played little role in the campaign. Incumbent President Harry S. Truman, knocked out of the race by a poor showing in the early primaries, decided to back Illinois Governor Adlai Stevenson. Stevenson had gained a reputation in Illinois as a reformer and intellectual; however, he had vacillated a great deal on whether he even wanted to run for the Presidency. President Truman had several meetings with Stevenson about the President's desire for Stevenson to become the standard bearer for the party. Truman became very frustrated with Stevenson and his high level of indecision before Stevenson actually committed to running. The Republican Party saw a dramatic battle for its nomination contest between Senator Robert A. Taft of Ohio and Eisenhower. The issue was foreign policy, with Eisenhower supporters attacking Taft as too isolationist. Taft saw little role for the United States in the Cold War. Eisenhower, the former NATO commander and war hero, narrowly defeated Taft. Ike, as everyone called him, then crusaded against the Truman policies he blasted as "Korea, Communism and Corruption." Eisenhower did well in all major demographic and regional groups outside the Deep South. ^ "The Presidents". uselectionatlas.org. David Leip. Retrieved January 3, 2009. The fight for the Republican nomination was between General Dwight D. Eisenhower, who became the candidate of the party's moderate eastern establishment; Senator Robert A. Taft from Ohio, the longtime leader of the Republican Party's conservative wing; Governor Earl Warren of California, who appealed to Western delegates and independent voters; and former Governor Harold Stassen of Minnesota, who still had a base of support in the Midwest. The moderate Eastern Republicans were led by New York Governor Thomas E. Dewey, the party's presidential nominee in 1944 and 1948. The moderates tended to be interventionists who felt that America needed to fight the Cold War overseas and resist Soviet aggression in Europe and Asia; they were also willing to accept most aspects of the social welfare state created by the New Deal in the 1930s. The moderates were also concerned with ending the Republicans' losing streak in presidential elections; they felt that the personally popular Eisenhower had the best chance of beating the Democrats. For this reason, Dewey himself declined the notion of a third run for president, even though he still had a large amount of support within the party. The conservative Republicans led by Taft were based in the Midwest and parts of the South. The conservatives wanted to abolish many of the New Deal welfare programs; in foreign policy they were often non-interventionists who believed that America should avoid alliances with foreign powers. Taft had been a candidate for the Republican nomination in 1940 and 1948, but had been defeated both times by moderate Republicans from New York (Dewey in 1948, and Wendell Willkie in 1940). Taft, who was 62 when the campaign began, freely admitted that 1952 was his last chance to win the nomination, and this led his supporters to work hard for him. Taft's weakness, which he was never able to overcome, was the fear of many party bosses that he was too conservative and controversial to win a presidential election. Warren, although highly popular in California, refused to campaign in the presidential primaries and thus limited his chances of winning the nomination. He did retain the support of the California delegation, and his supporters hoped that, in the event of an Eisenhower-Taft deadlock, Warren might emerge as a compromise candidate. After being persuaded to run, Eisenhower scored a major victory in the New Hampshire primary, when his supporters wrote his name onto the ballot, giving him an upset victory over Taft. However, from there until the Republican Convention the primaries were divided fairly evenly between the two men, and by the time the convention opened the race for the nomination was still too close to call. Taft won the Nebraska, Wisconsin, Illinois, and South Dakota primaries, while Eisenhower won the New Jersey, Pennsylvania, Massachusetts, and Oregon primaries. Stassen and Warren only won their home states of Minnesota and California respectively, which effectively ended their chances of earning the nomination. General Douglas MacArthur also got ten delegates from various states (mostly Oregon), but had made it clear from early in the race that he had no interest in being nominated. When the 1952 Republican National Convention opened in Chicago, Illinois, most political experts rated Taft and Eisenhower as neck-and-neck in the delegate vote totals. 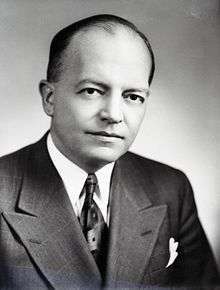 Eisenhower's managers, led by Dewey and Massachusetts Senator Henry Cabot Lodge Jr., accused Taft of "stealing" delegate votes in Southern states such as Texas and Georgia. They claimed that Taft's leaders in these states had unfairly denied delegate spots to Eisenhower supporters and put Taft delegates in their place. Lodge and Dewey proposed to evict the pro-Taft delegates in these states and replace them with pro-Eisenhower delegates; they called this proposal "Fair Play." Although Taft and his supporters angrily denied this charge, the convention voted to support Fair Play 658 to 548, and Taft lost many Southern delegates. Eisenhower also received two more boosts, firstly when several uncommitted state delegations, such as Michigan and Pennsylvania, decided to support him, and secondly when Stassen released his delegates and asked them to support Eisenhower, whose moderate policies he much preferred to those of Taft. The removal of many pro-Taft Southern delegates and the support of the uncommitted states decided the nomination in Eisenhower's favor. However, the mood at the convention was one of the most bitter and emotional in American history. When Senator Everett Dirksen from Illinois, a Taft supporter, pointed at Dewey on the convention floor during a speech and accused him of leading the Republicans "down the road to defeat," mixed boos and cheers rang out from the delegates, and there were even fistfights between some Taft and Eisenhower delegates. In the end, Eisenhower narrowly defeated Taft on the first ballot. To heal the wounds caused by the battle, he went to Taft's hotel suite and met with him. Taft issued a brief statement congratulating Eisenhower on his victory, but he was bitter about what he felt was the untrue "stealing delegates" charge, and he withheld his active support for Eisenhower for several weeks after the convention. In September 1952 Taft and Eisenhower met again at Morningside Heights in New York City, where Taft promised to support Eisenhower actively in exchange for Eisenhower agreeing to a number of requests. These included a demand that Eisenhower give Taft's followers a fair share of patronage positions if he won the election, and that Eisenhower agree to balance the federal budget and "fight creeping domestic socialism in every field." Eisenhower agreed to the terms, and Taft campaigned hard for the Republican ticket. In fact, Eisenhower and Taft agreed on most domestic issues; their disagreements were primarily in foreign policy. Though there were initial suggestions that Warren could have earned the party's vice presidential slot for the second successive election if he were to withdraw and endorse Eisenhower, he ultimately chose not to do so. Eisenhower himself had been partial to giving the VP nod to Stassen, who had endorsed Eisenhower of his own accord and had generally similar political positions. The party bosses, however, were keen to find a running mate who could mollify Taft's supporters, as the schism between the moderate and conservative wings was so severe that in the worst case it could potentially lead to the conservatives bolting and running Taft as a third-party candidate. The convention chose young Senator Richard Nixon from California as Eisenhower's running mate; it was felt that Nixon's credentials as a fierce campaigner and anti-Communist would be valuable. Nixon also had ties to both the Eastern moderates (Dewey was a strong supporter) and the conservative Taft wing of the party. As such, it was felt that he could help to reunite the party after the bruising primary and convention battles. Most historians now believe that Eisenhower's nomination was primarily due to the feeling that he was a "sure winner" against the Democrats; most of the delegates were conservatives who would probably have supported Taft if they felt he could have won the general election. Despite not earning the presidential or vice presidential nominations, Warren would subsequently be appointed as Chief Justice in October 1953, while Stassen would hold various positions within Eisenhower's administration. The expected candidate for the Democratic nomination was incumbent President Harry S. Truman. Since the newly passed 22nd Amendment did not apply to whoever was president at the time of its passage, he was eligible to run again. But Truman entered 1952 with his popularity plummeting, according to polls. The bloody and indecisive Korean War was dragging into its third year, Senator Joseph McCarthy's anti-Communist crusade was stirring public fears of an encroaching "Red Menace," and the disclosure of widespread corruption among federal employees (including some high-level members of Truman's administration) left Truman at a low political ebb. Polls showed that he had a 66% disapproval rating, a record only matched decades later by Richard Nixon and surpassed by George W. Bush. Truman's main opponent was populist Tennessee Senator Estes Kefauver, who had chaired a nationally-televised investigation of organized crime in 1951 and was known as a crusader against crime and corruption. The Gallup poll of February 15 showed Truman's weakness: nationally Truman was the choice of only 36% of Democrats, compared with 21% for Kefauver. Among independent voters, however, Truman had only 18% while Kefauver led with 36%. In the New Hampshire primary, Kefauver upset Truman, winning 19,800 votes to Truman's 15,927 and capturing all eight delegates. Kefauver graciously said that he did not consider his victory "a repudiation of Administration policies, but a desire...for new ideas and personalities." Stung by this setback, Truman soon announced that he would not seek re-election (however, Truman insisted in his memoirs that he had decided not to run for reelection well before his defeat by Kefauver). With Truman's withdrawal, Kefauver became the front-runner for the nomination, and he won most of the primaries. Other primary winners were Senator Hubert Humphrey, who won his home state of Minnesota, while Senator Richard Russell Jr. from Georgia won the Florida primary and U.S. diplomat W. Averell Harriman won West Virginia. However, most states still chose their delegates to the Democratic Convention via state conventions, which meant that the party bosses – especially the mayors and governors of large Northern and Midwestern states and cities – were able to choose the Democratic nominee. These bosses (including Truman) strongly disliked Kefauver; his investigations of organized crime had revealed connections between Mafia figures and many of the big-city Democratic political organizations. The party bosses thus viewed Kefauver as a maverick who could not be trusted, and they refused to support him for the nomination. Instead, with Truman taking the initiative, they began to search for other, more acceptable, candidates. However, most of the other candidates had a major weakness. Richard Russell had much Southern support, but his support of racial segregation and opposition to civil rights for Southern blacks led many liberal Northern and Midwestern delegates to reject him. Truman favored W. Averell Harriman of New York, but he had never held an elective office and was inexperienced in politics. Truman next turned to his vice-president, Alben W. Barkley, but at 74 he was rejected as being too old by labor union leaders. Other minor or favorite son candidates included Oklahoma Senator Robert S. Kerr, Governor Paul A. Dever of Massachusetts, Senator Hubert Humphrey from Minnesota, and Senator J. William Fulbright from Arkansas. One candidate soon emerged who seemingly had few political weaknesses: Governor Adlai Stevenson of Illinois. The grandson of former Vice-President Adlai E. Stevenson, he came from a distinguished family in Illinois and was well known as a gifted orator, intellectual, and political moderate. In the spring of 1952, Truman tried to convince Stevenson to take the presidential nomination, but Stevenson refused, stating that he wanted to run for re-election as Governor of Illinois. Yet Stevenson never completely took himself out of the race, and as the convention approached, many party bosses, as well as normally apolitical citizens, hoped that he could be "drafted" to run. The 1952 Democratic National Convention was held in Chicago in the same coliseum the Republicans had gathered in several weeks earlier. Since the convention was being held in his home state, Governor Stevenson – who still proclaimed that he was not a presidential candidate – was asked to give the welcoming address to the delegates. He proceeded to give a witty and stirring address that led his supporters to begin a renewed round of efforts to nominate him, despite his protests. After meeting with Jacob Arvey, the "boss" of the Illinois delegation, Stevenson finally agreed to enter his name as a candidate for the nomination. The party bosses from other large Northern and Midwestern states quickly joined in support. Kefauver led on the first ballot, but had far fewer votes than necessary to win. Stevenson gradually gained strength until he was nominated on the third ballot. After the delegates nominated Stevenson, the convention then turned to selecting a vice-presidential nominee. After narrowing it down to Senators John Sparkman, and A. S. Mike Monroney, President Truman and a small group of political insiders chose Sparkman, a conservative and segregationist from Alabama, for the nomination. The convention largely complied and nominated Sparkman as Stevenson's running mate. Sparkman was chosen because of his Southern identity and conservative record; party leaders hoped this factor would create a balanced ticket. The Eisenhower campaign was one of the first presidential campaigns to make a major, concerted effort to win the female vote. Many of his radio and television commercials discussed topics such as education, inflation, ending the war in Korea, and other issues that were thought to appeal to women. The Eisenhower campaign made extensive use of female campaign workers. These workers made phone calls to likely Eisenhower voters, distributed "Ike" buttons and leaflets, and threw parties to build support for the GOP ticket in their neighborhoods. On election day, Eisenhower won a solid majority of the female vote. 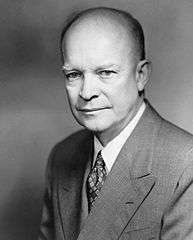 Eisenhower campaigned by attacking "Korea, Communism, and Corruption"—that is, what the Republicans regarded as the failures of the outgoing Truman administration to deal with these issues. The Eisenhower campaign accused the administration of "neglecting Latin America" and thus "leading them into the arms of wily Communist agents waiting to exploit local misery and capitalize on any opening to communize the Americas." Charges that Soviet spies had infiltrated the government plagued the Truman Administration and also became a "major campaign issue" for Eisenhower. The Republicans blamed the Democrats for the military's failure to be fully prepared to fight in Korea; they accused the Democrats of harboring Communist spies within the federal government; and they blasted the Truman Administration for the numbers of officials who had been accused of various crimes. In return, the Democrats criticized Senator Joseph McCarthy and other Republican conservatives as "fearmongers" who were "recklessly trampling" on the civil liberties of government employees. Many Democrats were particularly upset when Eisenhower, on a scheduled campaign swing through Wisconsin, decided not to give a speech he had written criticizing McCarthy's methods, and then allowed himself to be photographed shaking hands with McCarthy as if he supported him. Truman, formerly friends with Eisenhower, never forgot what he saw as a betrayal; he had previously thought Eisenhower would make a good president, but said, "he has betrayed almost everything I thought he stood for." Despite these mishaps, Eisenhower retained his enormous personal popularity from his leading role in World War II, and huge crowds turned out to see him around the nation. His campaign slogan, "I Like Ike," was one of the most popular in American history. Stevenson concentrated on giving a series of thoughtful speeches around the nation; he too drew large crowds. Although his style thrilled intellectuals and academics, some political experts wondered if he were speaking "over the heads" of most of his listeners, and they dubbed him an "egghead," based on his baldness and intellectual demeanor. Eisenhower maintained a comfortable lead in the polls throughout most of the campaign. A notable event of the 1952 campaign concerned a scandal that emerged when Richard Nixon, Eisenhower's running mate, was accused by several newspapers of receiving $18,000 in undeclared "gifts" from wealthy donors. In reality, contributions were by design only from early supporters and limited to $1,000, with full accountability. Nixon, who had been accusing the Democrats of hiding crooks, suddenly found himself on the defensive. Eisenhower and his aides considered dropping Nixon from the ticket and picking another running mate. Results by county explicitly indicating the percentage for the winning candidate. Shades of red are for Eisenhower (Republican) and shades of blue are for Stevenson (Democratic). Nixon saved his political career, however, with a dramatic half-hour speech, the "Checkers speech," on live television. In this speech, Nixon denied the charges against him, gave a detailed account of his modest financial assets, and offered a glowing assessment of Eisenhower's candidacy. The highlight of the speech came when Nixon stated that a supporter had given his daughters a gift – a dog named "Checkers" – and that he would not return it, because his daughters loved it. The "Checkers speech" led hundreds of thousands of citizens nationwide to wire the Republican National Committee urging the Republican Party to keep Nixon on the ticket, and Eisenhower stayed with him. Both campaigns made use of television ads. A notable ad for Eisenhower was an issue-free, feel-good animated cartoon with a soundtrack song by Irving Berlin called "I Like Ike." For the first time, a presidential candidate's personal medical history was released publicly, as were partial versions of his financial histories, because of the issues raised in Nixon's speech. Near the end of the campaign, Eisenhower, in a major speech, announced that if he won the election he would go to Korea to see if he could end the war. His great military prestige, combined with the public's weariness with the conflict, gave Eisenhower the final boost he needed to win. Throughout the entire campaign, Eisenhower led in all opinion polls, and by wide margins in most of them. To circumvent the local Republican Party apparatus mostly controlled by Taft supporters, the Eisenhower forces created a nationwide network of grass-roots clubs, "Citizens for Eisenhower." Independents and Democrats were welcome, as the group specialized in canvassing neighborhoods and holding small group meetings. Citizens for Eisenhower hoped to revitalize the GOP by expanding its activist ranks and by supporting moderate and internationalist policies. It did not endorse candidates other than Eisenhower. However Eisenhower paid it little attention after he won, and it failed to maintain its impressive starting momentum. Instead it energized the conservative Republicans, leading finally to the Barry Goldwater campaign of 1964. Long-time Republican activists viewed the newcomers with suspicion and hostility. More significantly, activism in support of Eisenhower did not translate into enthusiasm for the party cause. On election day, Eisenhower won a decisive victory, winning over 55% of the popular vote and carrying 39 of the 48 states. He took three Southern states that the Republicans had won only once since Reconstruction: Virginia, Florida, and Texas. This election was the first in which a computer (the UNIVAC I) was used to predict the results. Source (Popular Vote): Leip, David. "1952 Presidential Election Results". Dave Leip's Atlas of U.S. Presidential Elections. Retrieved September 16, 2012. Source (Electoral Vote): "Electoral College Box Scores 1789–1996". National Archives and Records Administration. Retrieved August 1, 2005. Election results in these states were within five percentage points (57 electoral votes). Tennessee and Kentucky were the two closest states. The 1952 election was the last time to date that Tennessee and Kentucky voted for different presidential candidates. Election results in these states were between five and ten percentage points (140 electoral votes). ↑ "Voter Turnout in Presidential Elections". The American Presidency Project. UC Santa Barbara. ↑ James Chace (2008). Acheson: The Secretary Of State Who Created The American World. Simon and Schuster. p. 326. ISBN 9780684864822. ↑ Page, Susan (April 22, 2008). "Disapproval of Bush breaks record". USA Today. Retrieved April 23, 2008. ↑ "1952: The Election of a Military Hero". The Press and the Presidency. Kennesaw State University, Department of Political Science & International Affairs. August 31, 2001. Retrieved November 20, 2008. ↑ Robert North Roberts; Scott John Hammond; Valerie A. Sulfaro (2012). Presidential Campaigns, Slogans, Issues, and Platforms. ABC-CLIO. p. 255. ISBN 9780313380921. ↑ Smith, Peter H. (2007) . Talons of the Eagle: Dynamics of U.S. - Latin American Relations (2nd ed.). Oxford University Press, USA. p. 392. ↑ Gibbs, Nancy (November 10, 2008). "When New President Meets Old, It's Not Always Pretty". Time. ↑ Mason, Robert (2013). "Citizens for Eisenhower and the Republican Party, 1951–1965". The Historical Journal. 56 (2): 513–536. doi:10.1017/S0018246X12000593. ↑ UNIVAC: the troubled life of America's first computer arstechnica.com. Retrieved February 9, 2012. ↑ Although he was born in Texas and grew up in Kansas before his military career, at the time of his election Eisenhower was president of Columbia University and was, officially, a resident of New York. During his first term as president, he moved his private residence to Gettysburg, Pennsylvania, and officially changed his residency to Pennsylvania. ↑ "1952 Presidential General Election Data – National". Retrieved March 18, 2013. ↑ United States Presidential Election Results Dave Leip's Atlas of Presidential Elections. Blake, David Haven. Liking Ike: Eisenhower, Advertising, and the Rise of Celebrity Politics (Oxford UP, 2016). xvi, 281 pp. Divine, Robert A. (1974). Foreign Policy and U.S. Presidential Elections, 1952–1960. McKeever, Porter (1991). Adlai Stevenson: his life and legacy. Patterson, James T. (1972). Mr. Republican: a biography of Robert A. Taft. Houghton Mifflin Harcourt (HMH). Gallup, George H., ed. (1972). The Gallup Poll: Public Opinion, 1935–1971. 3 vols. Random House. "It's a Free Country". Time Magazine. September 1, 1952. Retrieved May 6, 2008. Farewell address / "Military–industrial complex"
"And I don't care what it is"